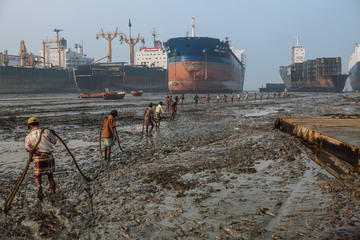 Chittagong is one of the largest shipbreaking yards in the world. The industry has been criticized for contaminating the environment and exposing low-paid workers to high risks. Shipbreaking is the process of dismantling an obsolete vessel’s structure for scrapping or disposal. Ocean-going ships, both mainly owned and used for their trade by developed countries, are demolished, together with their toxic materials, in developing countries. Each year, around 1000 large ocean ships reach the end of their service life and are broken down to recover steel. Yet only a fraction is handled in a safe, sustainable manner. 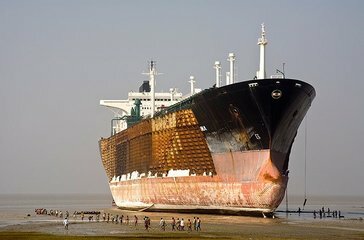 More than two-thirds of all end-of-life ships are simply run ashore on tidal beaches in Bangladesh, India and Pakistan where unscrupulous shipbreaking companies exploit minimal enforcement of environmental and safety rules to maximize profits (in connivance with shipping companies). Likewise, even though clean and safe alternatives are available elsewhere, the vast majority of ship owners, most of which are based in the EU, Japan and China, are unwilling to internalise the costs of safe and environmentally sound ship recycling and circumvent existing laws to maximise their profits. On the beaches of South Asia, poor migrant workers are deployed by tens of thousands to break down large ships manually, which are often full of toxics such as asbestos, lead, ozone depleting substances, PCBs and heavy metals. Little care is given to worker safety or protection of the environment. Ship owners and ship breakers obtain large profit avoiding decontamination, dumping environmental costs to workers, local farmers and fishermen. They practice cost-shifting. The toxics sicken the workers and ravage coastal ecosystems. The muddy sand and shifting grounds of tidal beaches cannot support adequate heavy lifting equipment or rapid emergency response, therefore accidents maim or kill countless of workers each year. The statistics are alarming. In Bangladesh, children count for 25% of the workforce. There and elsewhere, the total death toll runs into the thousands. Also, ten thousands of protected mangrove trees, essential to the ecosystem’s health and to the protection from cyclones and floods, are being cut to make way for ships. This and the accompanying poisons from shipbreaking have killed or devastated dozens of aquatic species, destroying also the livelihoods of surrounding fishing communities. Local civil society is organising in order to put pressure on the Govnerment of Bangladesh to regulate the sector. For instance, the 'Bangladesh Environmental Lawyers Association' (BELA; belabangla.org), a public-advocacy group, has filed several cases against the shipbreaking industry, accusing it of creating an unsafe work environment and producing environmentally unsafe waste. Bela, in collaboration with other organizations such as YPSA (Young Power in Social Action), has consistently demanded rights for the workers and the banning in Bangladesh of ships carrying poisonous substances. Judicial activism has obtained some victories. In 2009 BELA convinced the Supreme Court to ban all ship recycling not meeting certain environmental standards. Consequently, in May 2010, the Supreme Court had suspended the authorization of beaching following an umpteenth fatal accident in 2009 and a new action by BELA who demanded compliance with environmental and social standards. Attempts by shipyards to circumvent the Court’s decision had been successful, but the activity was then again suspended due to new fatal accidents (at least 12 workers have died in 2011). For a short period of time in 2011, site activity was stopped pending an investigation report and dismantling authorizations for new ships are suspended. The activity then started again, but starting in 2015 -as India and Pakistan-, has been hit by cheap steel imported from China. Its price is about 300 dollars per tonne, which is similar to the price at which local shipbreakers buy the ships, which then have to be dismantled. The Government of Bangladesh has recently introduced new national policies and legislation to improve the environmental and occupational health and safety standards in the ship breaking yards. But there is a long way to go. Governance is poor, and enforcement of policies and laws is often non-existent. Politicians and decision makers have vested interests in the industry, and corruption is wide spread making it difficult to enforce rules and regulations. Workers have started to organise in small trade unions at yard lleve in order to ask for better working conditions; however, the industry is not in favour of workers' organisation and the trade unions have not bargaining power. Local fishing communities have stated that the shipbreaking industry is undermining their livelihood; however, the local population does not have the means to oppose the powerful industry. The struggle is ongoing. Project Details The Chittagong shipbreaking area has more than 140 plots on a 10-15 km stretch of the beach situated around Sitakund. In 2009 more than 14 000 protected mangrove trees were illegally cut to make room for additional shipbreaking yards on the beach. 640 large ocean-going vessels were sold to Bangladesh for breaking between 2012 and 2014. Most of these ships were owned by European or East Asian shipping companies. (1) at the national level, Bangladeshi Platform members have been litigating for the enforcement of existing laws that limit the import of toxic waste as well as guarantees the respect of workers rights. In addition to the pollution cased by substandard shipbreaking practices to coastal areas, and workers', as well as local communities' exposure to hazardous materials , dangerous working conditions at the shipbreaking yards result in fatal accidents and severe injuries. 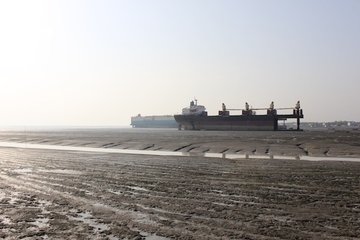 To halt imports of ships to Bangladesh, the Bangladesh Environmental Lawyers Association (BELA) has successfully filed several cases in the High Court - ships such as the Alfa, Blue Lady and Enterprise were banned from entering Bangladeshi waters. These cases prompted the Courts to ban the import of all ships that have not removed the toxic materials contained in their structure and in 2009 the Courts further ordered the closure of all shipbreaking yards as none of these had the necessary environmental permits. Finally the Courts ordered the development of new laws to regulate ship recycling. BELA has also successfully helped injured workers and the families of deceased workers obtain compensation as required by the law. Also with the aim to empower workers, YPSA, BILS and OSHE have provided support and prompted the involvement of trade unions. Finally, especially YPSA has been assisting journalist from around the world that have wanted to report on the conditions at the Chittagong shipbreaking yards. 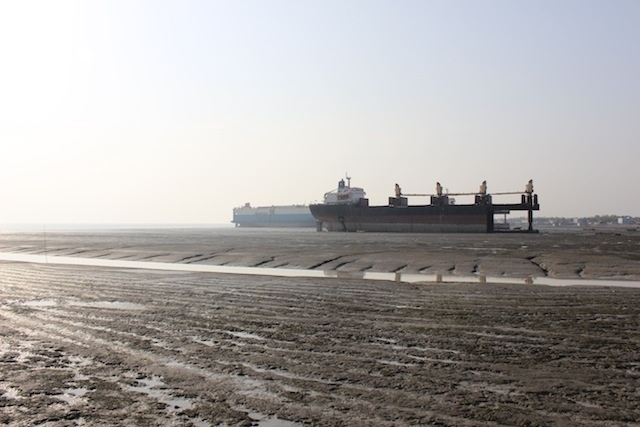 To halt exports of ships to beaching yards in Bangladesh, the Platform has worked to influence legislative development at the international and European level. Naming and shaming especially European companies that sell their toxic ships to Bangladesh the Platform has also attempted to influence ship owners to adopt policies on sustainable ship recycling. Other The statistics are alarming. In 2014, at least 17 workers have lost their lives at the Chittagong shipbreaking site, either crushed to death by falling steel plates, by explosions, fires or the release of toxic gases. Another 38 workers were reported seriously injured. There are however no official figures. Workers do not receive regular health check-ups, thus occupational diseases cannot be detected. There are no figures about long-term health impacts, such as cancer or asbestosis. Other A majority of workers are migrant workers from the North of Bangladesh, the poorest area of the country. They follow so-called contractors to the shipbreaking yard, who provide labourers to the foremen in the yards. The migrant workers do not have contracts or any direct employment relationship with the yard owners and often have the lowest paid jobs. The NGO Shipbreaking Platform and its members call on ship owner to only sell their end-of-life vessels to modern ship recycling facilities off the beach. By 2016, it is expected that the European Commission will publish a list of clean and safe ship recycling yards globally. The Platform will be recommending the use of these yards to ship owners. - The Government needs to close down all shipbreaking yards which do not operate in accordance with the Supreme Court rulings, operate without Environmental Clearances based on the assessment of their performance, or operate illegally on forest land, where mangrove trees have been cut illegally. - The Government must ensure that yard owners are held responsible for severe injures and deaths resulting from a lack of adequate infrastructe, equipment, oversight or training. So far, no yard owner has been held responsible for their negligence and breach of the law. - The Government needs to ensure that no child or adolescent workers under the age of 18 work in the shipbreaking yards. Yards in which workers under 18 are found, need to be sanctioned and eventually closed down if illegal child labour is not stopped. The shipbreaking sector must be taken into account in the Government’s strategy to eradicate worst forms of child labour. - The Government together with the relevant local authorities should develop and implement a «Green Ship Recycling Strategy», that is, a cross-departmental policy to allow for the much needed shift towards clean and safe ship recycling off the beach and compliant with international and domestic law, based on guidance offered by the Basel Convention, the ILO and the IMO. - The «Green Ship Recycling Strategy» should provide a roadmap for investments in the technical infrastructure of the shipbreaking yards to allow for the transition towards safer and environmentally sound methods off the beach (e.g. impermeable floors and drainage system, heavy lifting equipment, electricity and water supply). - The Government of Bangladesh should cooperate with the other shipbreaking countries in South Asia – India and Pakistan – in a joint effort to exchange experience and alter shipbreaking practices so that competitiveness is not based on the lowest standards, but that instead a ‘level playing field’ is negotiated between shipbreaking countries. - Taking into account already existing legal provisions, the Supreme Court rulings and obligations under international law, the Government needs to develop sector-specific shipbreaking rules. The new regulation needs to accommodate the overlaps in responsibilities between different government agencies at the national and local level and needs to clearly define the competent authorities’ roles. - The new regulation should be based on a comprehensive review of existing legislation and a gap analysis, and should allow for the implementation of international obligations under the Basel Convention (in particular Prior Informed Consent and Environmentally Sound Management of hazardous wastes) as well as the standards set out in the new EU Ship Recycling Regulation. - There is an immediate need for training, awareness-raising and capacity building for workers to ensure safe operations. The government should provide a training center and seek the assistance of the Basel Convention Secretariat and ILO for further guidance on materials and the organisation of the training. Adequate training must be a pre-requirement for work in the shipbreaking yards. Workers needs to be handed out certificates and training efforts needs to be documented. - The responsible authorities need to monitor the implementation of laws and have enforcement mechanisms in place. This includes a training programme tailored for the designated officials including the judiciary (for instance in the local Labour Court). Compliance needs to be monitored especially with regards to: workers’ registration for social benefits, provision and use of personal protective equipment (PPE), application of environmental, health and safety procedures, use of obligatory on-site pollution control and safety gadgets, periodic monitoring of maintenance and improvements of on-site equipment, provision of sufficient, improved and satisfactory on-site health care system, adequate training status of workers and awareness of hazards, maintenance of hazardous waste inventory and disposal. - The Government of Bangladesh should ratify the Basel Ban Amendment, thus prohibit the import of hazardous waste, and the Hong Kong Convention and seek early compliance with the provisions under the latter. Moreover, the Government should enforce all the provisions of the Basel Convention and seek guidance also from the EU Ship Recycling Regulation's standards for ship recycling facilities. - The Government should support a study to define the level and distribution of contamination in and around the shipbreaking yards, and develop an inventory of hazardous wastes (e.g. for the unmarked asbestos dumping grounds). It should identify “hot spots” that need to be cleaned up. It can seek the international organisations’ expertise and support for this task. The SBC (UNEP) has started a survey in that sense and the Government should make sure they cooperate and access the information gathered. Why? Explain briefly. Significant decisions towards environmental and social protection have been taken by the Supreme Court in Bangladesh. Several imports of vessels have been stopped by the Courts on the grounds that Bangladesh should not import toxic wastes. In 2009 all shipbreaking yards were required to close as none of them had the necessary environmantal permits to operate. In 2014 some of the yards situated where 14 000 mangrove trees were illegaly cut were eveicted and the Courts also ordered the replanting of the trees. The court ordered the consolidation of laws relevant for shipbreaking in line with both environmantal protection and workers' rights. However, most of the court's orders have been ignored by both the Government and the industry. 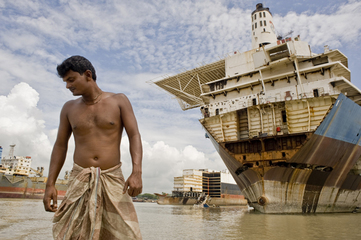 The Bangladeshi ship breaking industry remains a hazardous industry for both workers and the environment. Since 2009 most yards have been able to re-open based on environmental permits with extended deadlines for complience with relevant environmental requirements. Though illegal by Bangladesh law, children still make up about 20% of the workforce. Bangladesh remains the second most favoured destination for ship owners looking for maximum profits when selling their old ships. So far little attention has been given to the sector by governmental agencies. There is still no hazardous waste management system for the shipbreaking yards in Bangladesh. Hazardous waste store houses are empty and not in use. There is no asbestos landfil, no waste treatment facility, such as an incinerator for PCBs, and the yards do not have water treatment plants. The Maritime Executive, Is There Child Labor in Shipbreaking Yards?